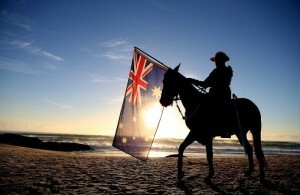 Residents are being encouraged to make a note in their diaries to attend this year’s ANZAC Day Commemoration Service. Anzac Day is a national day of remembrance in Australia and New Zealand, originally observed by both countries on 25th April every year to honour the members of the Australian and New Zealand Army Corps (ANZAC) who fought at Gallipoli in the Ottoman Empire during World War I.
British forces were also involved at Gallipoli with the (Mediterranean Expeditionary Force) 29th Division which landed on the same day, and Anzac Day now more broadly commemorates all those who served and died in military and peacekeeping operations for their countries. The Town Mayor will take part in tributes at this year’s ANZAC Day Commemoration Service, which is to be held at the Hailsham War Memorial on Sunday 28th April at 10.45am and organised by Royal British Legion Hailsham & District Branch.